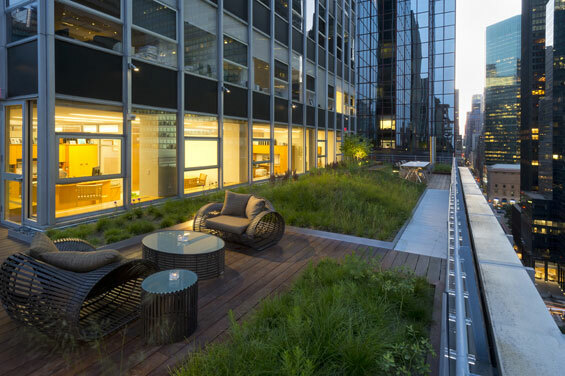 Redefining the 17th floor of the historic Western Publishing Building in midtown Manhattan, HM White has created a contemporary green roof garden terrace as an extension of Shorenstein Properties’ new corporate offices. 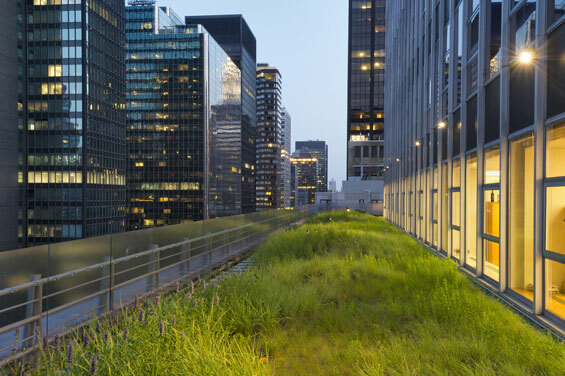 The 6,500 square-foot living roof establishes a biophilic transformation of the office environment and daily employee experience. 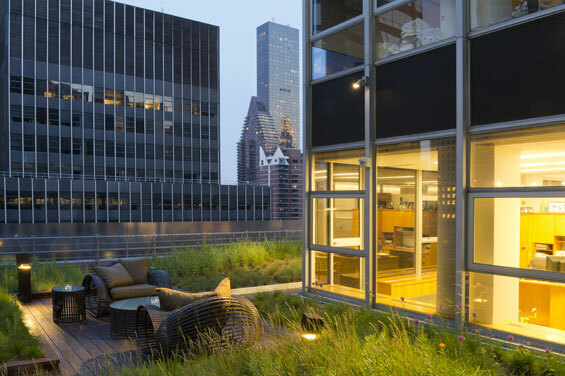 A lush, sculpted garden wraps the building and visually merges interior office spaces with a serene meadow landscape, layered in contrast to its dense urban context. The garden terrace design unifies the building’s roof with its restrained architectural geometries while expressing the planted surface as a rolling topographic relief. 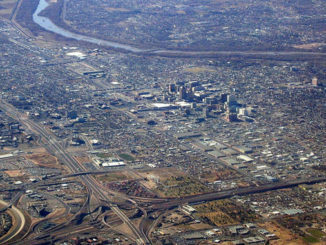 The vegetated landform is manipulated to accentuate depth of view from interior spaces through the landscape and highlight its undulating horizon against the city skyline. The entire garden is carefully engineered to knit with building infrastructure to prevent potential wind uplift, accommodate significant weight restrictions and support a sophisticated, multi-seasonal plant palette tolerant of extreme growing conditions. Comprised of native and regionally adapted plants, the elongated meadow design accentuates the sculpted surface with braided collections of drought tolerant grasses, perennials and spring bulbs—punctuated by flowering trees in structurally specific locations. The garden composition weaves seasonal colors and textures providing a dynamic tapestry with year-round visual interest. The office interior links with the exterior via a series of wooden platforms embedded in the landscape creating flexible “break-out” meeting spaces and places of respite perched 186 feet above the street. The intimate garden rooms connect with a perimeter path system framed by a translucent wind protection screen along the building’s edge. 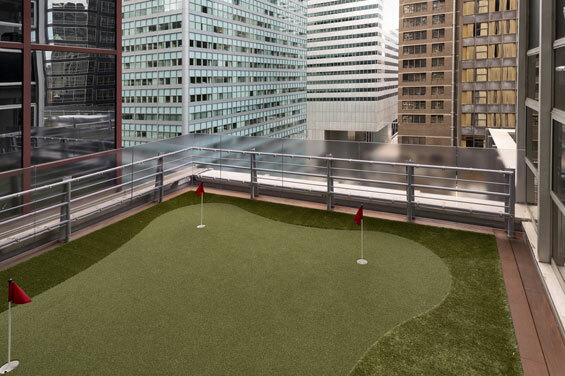 On the northwestern side of the building, linking with an employee break room, an isolated roof space is transformed into an outdoor golf putting green providing a whimsical gaming retreat instantly popular with staff. Establishing a sustainable retrofit of the 1962 Emory Roth & Sons building design, HM White synthesizes strict structural limitations and budgetary restraints with state of the art green roof technology and horticultural practices.